I want to present you another painting tutorial for Age of Sigmar Nighthaunt army. 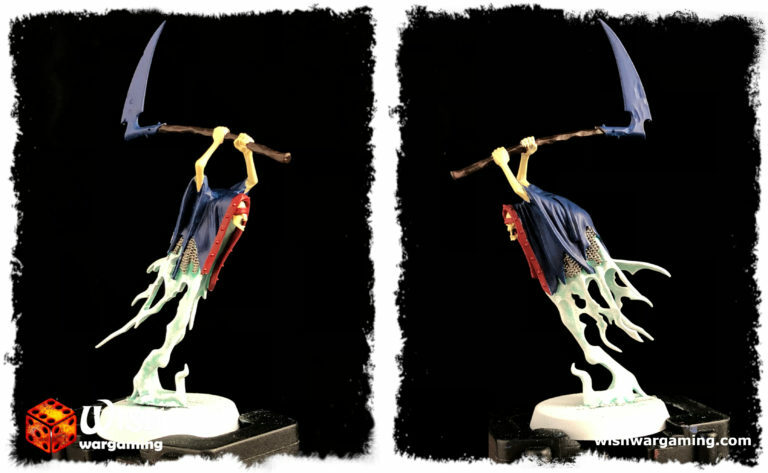 This time I’ll show you how to paint fast and easy Grimghast Reaper model – cursed, indiscriminate killer armed with double-handed slasher scythe. 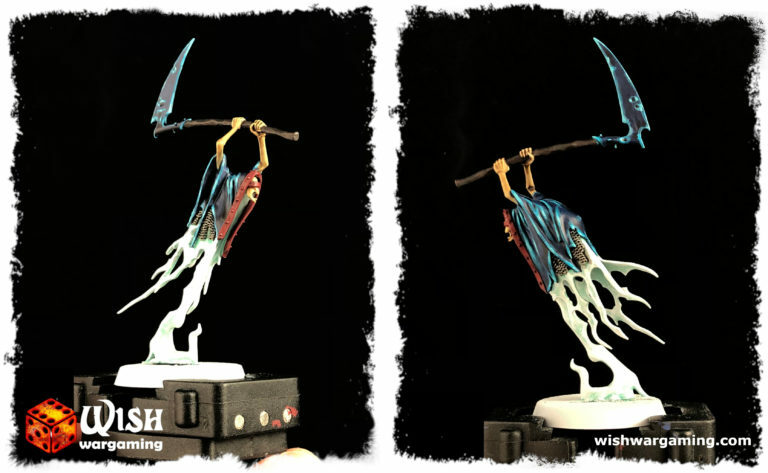 Same as for Chainrasp model, its also from AOS Soul Wars box starter set. With minimum effort you can make it look really good – thats why again I will recommend you to go for full paint scheme. I also want to show you how you can try to paint spectral weapons instead of metal rusted ones. With this tutorial you should be able to finish all 4 models from Soul Wars within 3-4 hours painting session. Check out also my Video Tutorial for this miniature on my channel! Assemble your miniature and remove all mold lines. 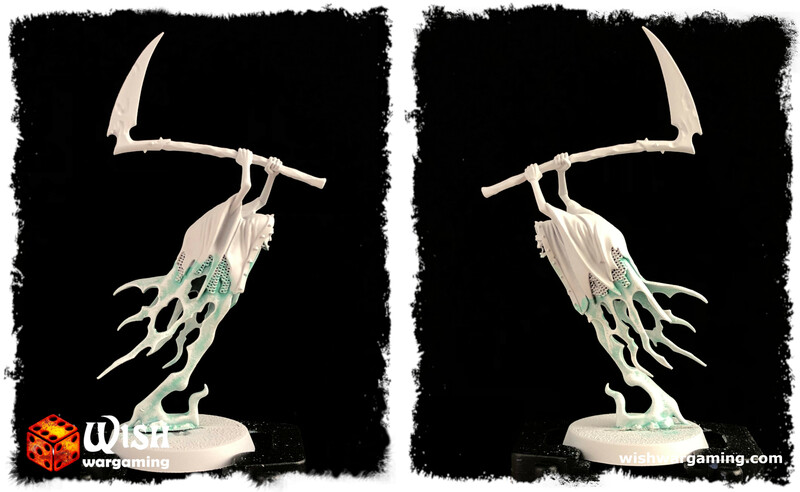 I found during this that models for Nighthaunt at this point have situations where there are visible holes between parts. To fix this you can use some green stuff or modelling putty. Small additionall tip – don’t glue miniature to the base. Especially if you paint in batch this will help you for fast painting bases.Use Corax White Spray as a primer. As you noticed cloak is separated in two parts. We will now focus on the lower one – we will wash it with watered-down Nihilakh Oxide Technical paint. Let it cover all parts of miniature and don’t worry if it accidentally go on other parts – they all be in darker colors so it really doesn’t matter. Make heavy drybrush using Ulthuan Grey Base paint and next go for Scar White and do the same but with more focus on edges. Paint wooden scythe shaft using Rhinox Hide. Paint chainmail using Leadbelcher Base. Paint upper cloak using Kantor Blue. Use the same paint for scythe head. Use Ushabti Bone for arms and skull. Using Khorne Red paint decorative outer part of the cloak and headband on the skull. Base colors done so at this point we will apply shades – start from Drakenhof NightShade and apply it to blue cloak parts and scythe head. After it will dry use Agrax EarthShade for bones, skulls and scythe handle. At the same time you can apply Nuln Oil on to chainmail and Carroburg Crimson to the red ornaments on the cloak. Now we will start going for Highlights on the main blue part of the cloak. First start with Sotek Green and paint it smoothly over every edge and all of the folds. Do the same on all edges of the scythe. Next take Temple Guard Blue and paint it on the same edges. This time don’t cover with it full lines but make short ones on the corners, folds and in the middle of edges – around 40% of highlight area. Next take Baharroth Blue and in the middle of those lines place dots or short lines. This will all together give your grimghast more spectral and ghostly look. Use Runefang Steel to gentle drybrush chainmail. Drybrush scythe handle using Baneblade Brown color. Drybrush with Screaming Skull bone parts of the miniature, do it with smaller brush and try not to leave marks on other parts. Now we will start going for Highlights on red ornament of the cloak. Go for edges using Evil Sunz Scarlett and paint it smoothly. If you want you can next as an option take Wild Rider Red and paint corners and upper part. Use Balthasar Gold to paint all those brads on the red ornament. Miniature is finished at this point so only thing left to do is base. Paint it with Eshin Grey, add PVA glue, and some flock or rocks. After it will dry go again with Eshin Grey and then follow with drybrush of Adiministratum Grey. Now glue miniature to the base, paint or glue some addons if there are visible holes. Add some glow effect to the base where spectral form touches with the ground – drybrush area around it using Baharroth Blue and next drybrush more gently around centre using Ulthuan Grey. Add some static grass or other addons to the base and enjoy your work. I hope this tutorial will help you getting your NightHaunt army done very fast. The same technique you can apply to every type of NightHaunts becasue they’re all very similiar for painting. 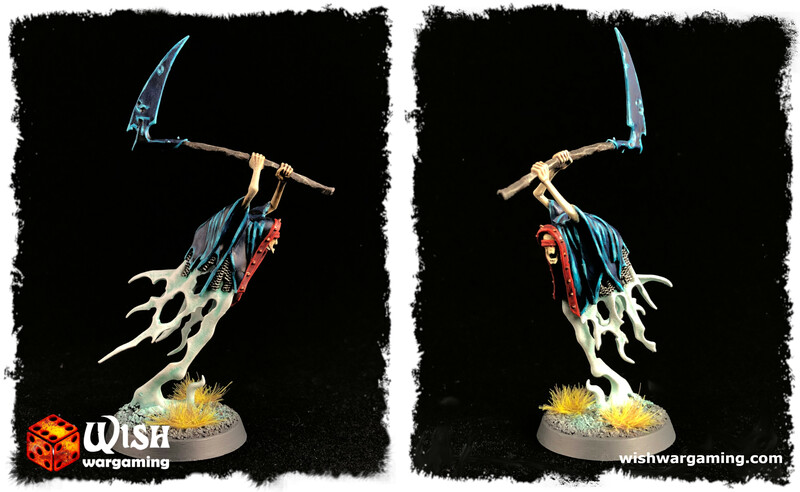 Check out also my previous tutorial for using red colors for your Nighthaunts. If you like my blog and you want to receive all updates from WishWargaming.com you can follow me on Facebook, Instagram, Twitter, Pinterest and Youtube. Feel free also to leave every kind words, comments or questions below. Hi – very nice tutorial, I really like the colors for this Nighthaunts!